Shirts With Random Triangles: Two Texas A&M players dismissed following their arrest on armed robbery and drug possession charges. Two Texas A&M players dismissed following their arrest on armed robbery and drug possession charges. Dairian Clairborne's mugshot. Via the Bryan-College Station Eagle. Darian Clairborne and Isaiah Golden are ex-Texas A&M Aggies. The linebacker and defensive tackle were dismissed from the Texas A&M football program as a result of their being charged with armed robbery. The pair were charged on Tuesday on charges for an incident that happened on May 23. According to the College Station, Tx. police, "three men reported being robbed, including one who said he was struck in the face with a handgun." The men have admitted that they were trying to "to buy marijuana from the suspects when one of them pointed a gun and the other took the money before fleeing on foot." 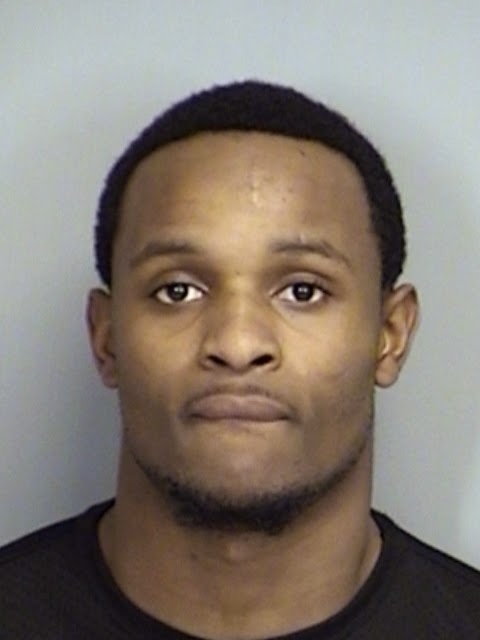 Clairborne and Golden have been charged with aggravated robbery, along with drug possession charges stemming from the police investigation into the incident. Clairborne and Golden had both been on suspension for separate incidents in February. Clairborne was suspended after an arrest on a misdemeanor marijuana possession, while Golden was arrested on charges related to a "noise violation."